among the aisles: Record Fair! So apparently something's wrong with the economy or something. I can't even pretend to understand any of it, and as long as it doesn't effect libraries or second hand bookstore I guess I don't have to worry, but bugger me if records aren't getting expensive. The New Zealand dollar used to be worth almost 80 US cents, and now it's just a little over 50. And to make matters worse everybody seems to be releasing amazing records; as well as the Crystal Stilts and caUSE co-MOTION lps Slumberland keep releasing an irresponsible number of great singles, then Comet Gain have got their new album and single (I don't think the world needs me to rant about their video too, but lets just say I disapprove), and there's the cute little Vivian Girls package. It's almost enough to make me get a real job. Almost. 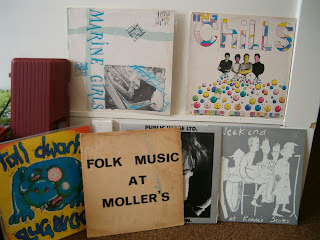 The real find is that 'Folk Music At Moller's', which was actually picked up by my girlfriend. It's a selection of recordings from the Auckland Folk Music Festival in Oratia in 1978. I think she bought it just because she liked the cover, but it's genuinely really great. I've been meaning to convert it to mp3 so I can share some of the songs around, but lets just say for now that Amazing Hoggett are perhaps my new favourite band. that is an awesome haul! jealous of your marine girls find. it's awful that real groovy has gone into receivership, though - what's going to happen to it? ?